New this summer at Lindenhurst Park District we are offering a Co-Ed In-House T-Ball League for 3-5 year olds. This T-Ball League offers opportunities for all skill levels. The program will teach teamwork, fair play, rules of the game, as well as catching, throwing and hitting. All games will be played at the Forest View Park on the baseball fields. Games will be played on Saturday (game times vary) with one practice during the week, depending on availability. The Park District will provide each participant with a t-shirt and hat. Some equipment will be provided to each team, but each player must have their own glove. VOLUNTEER COACHES NEEDED, league will not be possible without volunteers. If interested call Zac Reimer at 847-356-6011, email at zreimer@lindenhurstparks.org, or write on registration form. Special requests based on carpooling and friendships cannot be granted. Introduce your child to America’s past time in a fun and creative way. While the basic skills such as fielding, catching, and batting will be covered, your child will never be bored, as we make sure all kids stay moving and involved. Ball and bats are provided so just bring your glove and let’s play ball. Games will be played. “Take me out to the ball game”...for a whole week! This t-ball camp will be a hit for any child looking to improve on his or her athletic abilities or learn the basics! 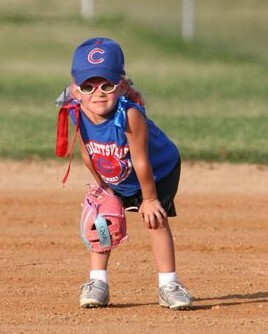 Each child will have fun everyday while covering fielding, bating, catching, and running the bases! The only equipment needed to participate is a glove. See you out in the sun!